A recent market study published by PMR– “Cardiac Marker Analyzer Market: Global Industry Analysis 2013 – 2017 and Forecast 2018 – 2026” consists of a comprehensive assessment of the most important market dynamics. On conducting a thorough research on the historic as well as current growth parameters of the cardiac marker analyzer market, growth prospects of the market are obtained with maximum precision. The report features unique and salient factors that may have a huge impact on the cardiac marker analyzer market during the forecast period. It can help market players to modify their manufacturing and marketing strategies to envisage maximum growth in the upcoming years. 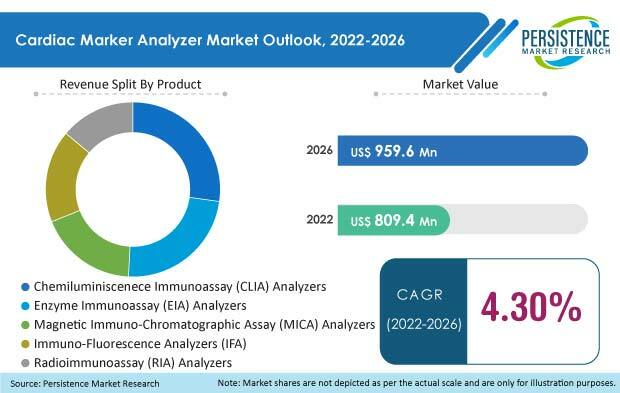 The report provides detailed information about the current and future growth prospects of the cardiac marker analyzer market in the most comprehensive way for the better understanding of the readers. This chapter explains the historical (2013–2017) and forecast (2018–2028) cardiac marker analyzer market in China by product type, end user and by country. In this chapter, the readers can find detailed description of the market structure by tier and market share analysis (2017). Major manufacturers such as Abbott Laboratories, Beckman Coulter Inc., F. Hoffmann-La Roche Ltd., Siemens AG, Creative Diagnostics, Quidel Corporation, Radiometer Medical Aps, Boditech Med Inc. and Mitsubishi Chemical Europe GmbH hold a promising revenue share in the cardiac marker analyzer market. These companies are endeavoring to launch novel product lines in the cardiac marker analyzer market. The companies operating in the cardiac marker analyzer market are focusing on mergers and acquisitions to expand their portfolio. To expand their presence in the cardiac marker analyzer market, they are collaborating with local wholesalers, distributors, and retailers. Globally, the prevalence of cardiovascular disorders is increasing and it is becoming a severe ongoing struggle for the world population. The prevalence of heart failure is increasing rapidly, with 26 million patients globally. According to the WHO, 17.7 million people die every year due to cardiovascular diseases, which is estimated to be 31% of all the deaths throughout the globe. In the U.S., the prevalence of myocardial infraction is 3.3% and prevalence of angina pectoris is 4.5%, which is expected to increase over the forecast period. Due to rise in prevalence of cardiovascular diseases, it has become an utmost need for the early detection of cardiac diseases. Thus, the rising prevalence of cardiovascular diseases is expected to fuel the growth of the global cardiac marker analyzer market over the forecast period. Geriatric population is increasing globally. According to the National Institutes of Health (NIH), around 8.5% of the world population was aged 65 or above in 2016, and by 2050 this percentage is expected to grow to around 17%. Rise in geriatric population is also associated with increasing cardiovascular disorders such as heart failure, myocardial infraction and angina pectoris. Rise in geriatric population is expected to drive the cardiac marker analyzer market positively. Obesity has become the global health challenge in the past few decades, with every sixth person being obese. According to the WHO, the number of obese population around the globe has doubled in the last two decades. The WHO also estimated that 1.9 billion adults are suffering from overweight and of these over 650 are obese. This survey also estimated that around 13% of world adult population is suffering from obesity. Obesity is associated with a number cardiovascular diseases such congestive heart failure, angina pectoris and myocardial infarction. The rising obese population, which is at a high risk of developing cardiovascular diseases, is expected to consequently increase the demand for cardiac marker analyzers. Inorganic strategies are contributing to the revenue growth of the participants operating in the market—a well noted phenomenon in developed markets. For example, the U.S. Federal Trade Commission (FTC) has allowed Abbott’s US$ 5.3 Bn acquisition of Alere. Abbott noted that they would diversify their business offering for point-of-care testing across the cardio metabolic, molecular and toxicological testing platforms. The deal will lead to a stiff competition among the existing market players. The cardiac marker analyzer helps in detecting various cardiovascular diseases, it provides rapid and real-time results, and plays a vital role in individualized treatment and disease management. Diagnostic information treatment decisions allow clinicians to reduce the likelihood of unnecessary adverse events. Many diseases and conditions can be managed using customized, real-time approaches. As medicines are becoming personalized, health information technology and integrated communication networks have enabled better channeling of patient diagnostic information to inform the timing and nature of evidence-based health interventions. The importance of cardiac marker tests during the treatment of various cardiovascular disease is expected to fuel the growth of cardiac marker analyzer market over the forecast period. This section of the report features profiles of the key players operating in the cardiac marker analyzer market based on their market shares, differential strategies, product offerings, marketing approach, and company dashboard. Examples of some of the key players featured in this report include Abbott Laboratories, Beckman Coulter Inc., F. Hoffmann-La Roche Ltd., Siemens AG, Creative Diagnostics, Quidel Corporation, Radiometer Medical Aps, Boditech Med Inc. and Mitsubishi Chemical Europe GmbH. Abbott Laboratories offers a range of cardiac marker analyzers. Popular brands for cardiac marker analyzer of the company include AQT90 FLEX analyzer, ARCHITECT i1000SR, ARCHITECT i2000SR, ARCHITECT i4000SR, ARCHITECT ci4100, ARCHITECT ci8200, i-STAT System, i-STAT System Wireless and i-STAT Alinity. The key manufacturers of cardiac marker analyzer are focusing on novel marketing strategies to increase product penetration. Most of the companies are focusing on acquisitions, mergers, expansion, launches, and agreements as the key strategies to increase the sale of their cardiac marker analyzer products in different geographies. Cardiac marker analyzer is a medical device used for the screening of cardiovascular disorders such as heart failure, myocardial infraction and angina pectoris using cardiac biomarkers. Research studies have been conducted on the cardiac marker analyzer market for the forecast period 2018 to 2026. The report offers a comprehensive evaluation of the business opportunities prevailing in the cardiac marker analyzer market along with insights on the trends, market dynamics, market opportunity analysis, and market competition. The report elaborates the macroeconomic factors influencing the dynamics of the cardiac marker analyzer market and its futuristic potential. The report offers a comprehensive taxonomy of cardiac marker analyzer market based on product type and region. The cardiac marker analyzers include Immuno-Fluorescence Analyzers (IFA), Magnetic Immuno-Chromatographic Assay (MICA) Analyzers, Chemiluminiscenece Immunoassay (CLIA) Analyzers, Radioimmunoassay (RIA) Analyzers, and Enzyme Immunoassay (EIA) Analyzers. End-use segments in cardiac marker analyzer market which are a part of this cardiac marker analyzer market report include Hospitals, Diagnostics Centers, Academic and Research Institute. The cardiac marker analyzer market has been analyzed across regions of North America, Latin America, Europe, Asia Pacific Excluding China, China, and MEA. What is the revenue potential of the cardiac marker analyzer market across North America and Europe? Who are the key competitors and what are their portfolios in cardiac marker analyzer market? What are major challenges influencing the growth of the cardiac marker analyzer market? How intervention from regulatory authorities is shaping the cardiac marker analyzer market growth?